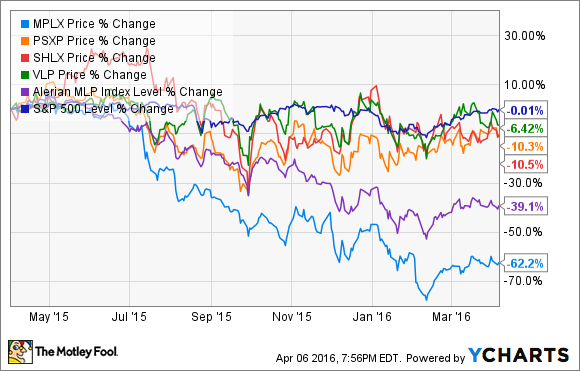 Has the Oil Crash Killed This Energy Dividend Stock's Potential for Greatness? Find out if the worst oil crash in over 50 years could derail this fasting growing dividend energy stock's plans for greatness. Energy prices have proved far less predictable than most Wall Street supposed "experts" have predicted. Most energy stocks, even supposedly secure dividend-paying midstream MLPs such as MPLX (NYSE: MPLX), have been taken to the cleaners over the past year. Fast growing, refiner-sponsored midstream competitors such as Phillips 66 Partners (NYSE: PSXP), Shell Midstream Partners (NYSE: SHLX), and Valero Energy Partners (NYSE: VLP), have held up amazingly well over this same time period. Let's examine why investors have soured on MPLX to such a great extent, and most importantly, whether they're wrong to have punished this MLP so severely. MPLX and its peers have always been sold to investors under a long-term income growth thesis, and thus it's understandable that a 50% reduction in payout growth guidance would cast doubt on this investment thesis. What's more, the guidance, which had previously been for several years, is now only for this year. Thus, many investors may be concerned that, should energy prices not recover for several years, future quarters will bring even more downward guidance revisions. "These factors contributed to our decision to provide new distribution growth guidance ... to an expected 12% to 15% distribution growth rate for 2016, revised from the prior 25%," said CEO and Chairman Gary Heminger. While the risk is real, to understand whether MPLX's current valuation makes sense, one needs to understand why the collapse of crude prices hasn't hit the MLP's competitors in the same way. "The continued decline in commodity prices and the market's increasing belief that these conditions will persist for some period of time has a direct impact on our producer customers," Heminger said. "Well, our producers are in some of the best areas and continue to manage our capital production plans very carefully, but changes in volume growth will continue to impact income growth for the partnership." The reason Wall Street has increasing doubts about MPLX's ability to deliver on its distribution growth promises is its recently closed merger with MarkWest Energy Partners, which has created direct exposure to commodity prices. Previously, all of MPLX's cash flows came from acquiring and obtaining long-term-contracted, fixed-fee cash flow from its sponsor and general partner, refining giant Marathon Petroleum (NYSE: MPC). This is the same commodity-insensitive business model that Phillips 66 Partners, Shell Midstream Partners, and Valero Energy Partners use, and it's one of the biggest reasons their unit prices have held up so well. Because energy prices have fallen so much, MPLX's new MarkWest assets have thus far failed to provide a boost to distributable cash flow (DCF), which is what's needed to sustainably grow its payout. For example, in Q4 of 2015, MarkWest's contributions to MPLX's DCF was negative-$16 million. In other words, until energy prices recover, investors probably won't benefit from the kind of DCF growth they were expecting. In the meantime, though, the MLP's balance sheet and unit count were greatly expanded by the large amount of equity and debt it had to use to fund the deal. "We intend to reduce leverage during the year through growth and EBITDA, and we do not anticipate any net new debt in 2016," said CFO Nancy Buese. "We anticipate utilizing a combination of funding from MPC and opportunistically accessing the capital markets from the equity perspective to fund our 2016 growth capital plans." As you can see thanks to the MarkWest Merger MPLX's leverage ratio is now higher than its peers; a fact that management is wisely choosing to correct this year. However, the midstream MLP business model is dependent on ongoing access to cheap debt and equity capital to achieve profitable growth in DCF. With its unit price having crashed so hard, investors were worried that MPLX wouldn't be able to raise equity at a high enough price -- a problem its competitors don't share -- to make dropdowns such as Marathon Petroleum's inland marine assets accretive to DCF per unit. Luckily for investors, thanks to the recent strong rally in oil prices, MPLX's price rose high enough to strike a deal with its sponsor to buy Marathon Petroleum's marine division for $600 million via a 23 million-unit equity offering, priced at $26.09, which represents 7.7% investor dilution. Since Marathon Petroleum will waive all Q1 2016 distributions from MPLX, combined with this deal's low price (price/EBITDA of 5.0), the acquisition should prove accretive to MPLX's DCF per unit. In fact, management is forecasting around $3.24 per unit in 2016 DCF, which should easily cover the current $2 per unit distribution. With far more debt and perilous access to equity growth capital relative to Phillips 66 Partners, Shell Midstream Partners, or Valero Energy Partners, resulting from higher commodity exposure, this MLP requires investors to understand the higher risk they're taking by investing in it. However, while MPLX's short-term growth capital access may be lower than that of its peers, its higher yield adequately compensates for this risk. Given the strong long-term growth potential of America's energy production capacity, I still think it's worth considering at today's prices.